Have you in any way suffered data loss on your system due to bad freeware backup software? The best way to avoid that is to download a PC backup software, and AOMEI Backupper Standard is the right software for carrying out this best protection to your computer from losing data. AOMEI Company provides the easiest Backup Service for systems and they recently upgraded their free backup software to 4.1 version. This recent update called AOMEI Backupper Standard 4.1 software protect and backup your system Desktop PC and Laptop data just for free. This free backup software goes a long way to ensure data security with easy and fast operations when installed on you Computers. That is to say, when you have AOMEIfree backup software installed, you don’t need to worry about future accidents that usually lead to lose of data. So that means, you can easily restore all your data when such happens. You don’t need to be an IT expert before you can use AOMEI Backupper Standard software, because it is an all-in-one backup application. With this backup software, you can sync, perform recovery and even clone software and many other features which I have already explained below. I enjoyed using this software on my personal computer because It allowed me back up my business files, folders, dynamic volumes, hard disk drives, system drives, partitions and applications, not only that, even to restore these data(s) when I mistakenly delete of loss them. It supports disk cloning and can be used to clone SSD to SSD, HDD to SSD, and HDD to HDD for the purpose of disk upgrade and data migration. Are you wondering if this special backup software will be compatible with your PC device? Then worry less because AOMEI Backupper supports almost all Windows operating System version and they include; Windows XP (all editions, 32/64-bit), Windows Vista, Windows 7, Windows 8.1, Windows 8, and Windows 10. I recommend you to choose this AOME free PC backup software because it will go a long way to retain your system memories. >Ability to backup system and also create a system image in order to keep Windows and applications safe for use. >Ability to backup your entire hard disk (HDD), SSD, specified partitions to create an image file. > Ability to backup and sync your important files and folders in regular basis. > Best incremental backups that save time and your system storage. >Best clone for smaller HDD to a larger HDD for disk upgrade, for better performance clone HDD to SSD. >Ability to set a schedule for Automatic file sync. >Ability to create a WinPE or Linux bootable disc for bare metal or for unbootable computer. > AOMEI software backup your internal disks, external hard drives, USB flash drives and other storage devices your Windows system can access. 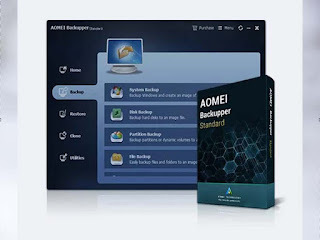 AOMEI Backupper Standard 4.1 version is simply the best and easiest tool for your system backup, File Backup, Disk Backup, Partition/Volume Backup, Automatic/Schedule Backup, Incremental & Differential Backup, and File Synchronization. So go right away and get it downloaded and installed on your Windows PC personal computers, Laptops and Desktops just for free. You can also upgrade to pro or premium (paid) version for full access to the features. Say no to data loss caused by malware or crash with AOMEI Backup fix.